How’s that for a challenging statement, eh? When I found this graphic on an Internet atheism community, I knew I had to grab it and explore the viewpoint — as much for me as for you. I would have thought that it would be impossible for a person to sit at the bedside of a dying child and NOT believe in God. I am hard-pressed to think of a better place in which to find God – amidst the crippling heartache and shattered dreams of parents, siblings and family. It is the convenience of living in the western world, overflowing with an optimism fueled by a seemingly never ending supply of individualism and materialism, which insists that life is grand! Sure, life is filled with mounds of joy and the pursuit of happiness. But pain, disappointment and death also fall like rain. Every single day. Sooner or later, we must come to grips with the reality, no matter how painful it is, that we live in a broken and hurting world. The gift of God is His presence and that in His plan there is a promise of better things to come. This world isn’t all there is, but right now, it is all that we have. We live in brokenness, but God is already working out His plan. Doesn’t that give you lots to think about? 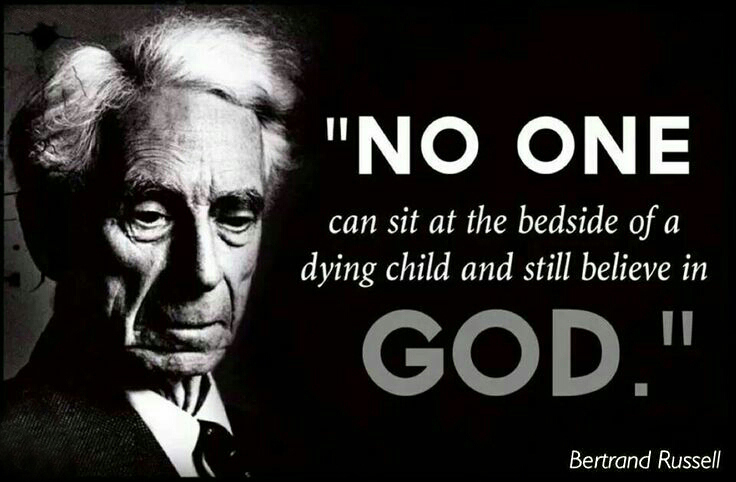 It occurs to me that behind the statement in the graphic, made by a renowned 20th century philosopher/atheist/writer, is this question: How can one sit by the bedside of a dying child and still believe God is good? First, let’s remember that no “religion” has ever promised that life would be perfect for even one person. In my faith, Jesus Christ (whom serious Christians, and many others, believe is the son of God) told his followers: “In this world you will have troubles. But be brave! I have defeated the world!” That’s in the Bible, in a section simply called “John”. God doesn’t spare us from [our troubles], he doesn’t shield us from [our troubles], but He does deliver us. We may come out the other side with scars and losses, but we will come out the other side. Even if our suffering results in death, we will be delivered into the hands of God. That’s the key part of the question about the goodness of God. If you believe this world and this life is all there is, then the idea of God delivering you from your ills – and, in the case of the graphic that sparked this essay, your child’s ills – is simply utter nonsense. And you have no hope. But if you somehow know that 70-plus years on planet Earth can’t be the entire story, then consider God’s gift of His son. Jesus’ sacrificial death and resurrection — which are at the very core of the Christian faith — clears the way to eternal life for you, your children and anyone else who accepts that gift and makes Jesus Lord and Savior. Does this makes sense? Yes or no, post your thoughts below and let’s have a conversation. As a parent, I can’t imagine the heartache that one would face if one’s child were dying. But as a born-again, Spirit-filled follower of Jesus, I have been “brought through” enough heart-breaking situations to know that my Jesus is well able to take me through even the death of a child. Unfortunately, the person who made that statement had not taken the time to find Jesus for himself. So instead of drawing closer to Jesus at this most critical time, he pulled further away and bitterness filled his heart. Pity. God’s goodness in the midst of my times of pain and sorrow is the only thing that keeps me going long enough to be delivered from that same pain and sorrow. I would be lost and utterly hopeless without God. What your pastor friend shared with you is so true. This life is a broken one, but God is with us through the pain and suffering and there is eternal life, a perfect life, offered to us through the sacrifice of Christ Jesus. We can live in hope! It makes complete sense when much of what happens in this world makes no sense. FAITH – believing in what we do not yet see. because, “God” is NOT Physical, but, Spiritual. A szülőnek nincs nagyobb fájdalma, mint az hogy ha elveszíti gyermekét. Azt látja, hogy iszonyú fájdalmakkal küzd gyermeke, de nincs segítség és egyetlen megváltás ha elhagyja ezt a földi létet. A szülő abban a pillanatban csak azt érzi, hogy elveszítette őt.Ekkor segít az,ha szembe tud nézni azzal, hogy vannak dolgok amelyek felette állnak, amely nem megfogható, de reménykedik, hogy gyermeke egy “szebb világba” érkezik. Ha hiszem azt, hogy a remény velem van,akkor ezt Isten adta az embereknek és azt a lehetőséget, ha elfogadta a reményt, akkor egy lépéssel tovább tudott lépni és megbékélni. Aki átélte bármely családtagjának, vagy “lelki társának” elvesztését, az később tudja, ha elfogadta a reményt, idővel lassan gyógyul a lelke, de a “heg” megmarad. Ha egy kisgyermek ezt kérdezi, hogy van e Isten amikor fájdalmai vannak, persze attól is függ, hogy hány éves és mennyire volt vallásosan nevelve és mit tud Isten létéről. Azt nehezen tudom elképzelni, hogy kicsi korban 4- vagy 5 évesen évesen ezt kérdezi,Talán az marad meg benne, hogy őt most megfogja Isten gyógyítani, nem tudom, de ilyennel még nem találkoztam, remélem soha nem is fogok. Neither shall they say Lo here! or, Lo there! for, behold, the kingdom of God is within you. Now, these words of Jesus are not heard from the pulpits! In short, if, though we suffer, the kingdom of God is realizable here and now, suffering and bliss, our illusions, are seen through and our true state is comprehended. Then, one can sit at the bedside of a dying child with spiritual experience and true knowledge and not be plagued with a question of whether God is good or not, it seems to me. Certainly the pain and anguish are felt, but without clinging, without desperate casting about as to whether God is good or not. Excellent post Frank. I remember a pastor saying that we Christians have been accused as using Christianity as a crutch . He confessed it was not a crutch but a full out body stretcher ! I agree with that description and am prompted to encourage those that don’t know the Lord that He is the One that is with us in our pain. Lay it down for Him to help with and to carry!